I had good intentions towards the following two titles, honestly I did! However, they both fell flat for me in different ways and so I gave them up. First off, I attempted to read Magic Island : The Fictions of L.M. Montgomery, by Elizabeth Waterston. Waterston is an English professor at University of Guelph in Ontario. She is co-editor of the five "Selected Journals of Lucy Maud Montgomery." She has written several academic articles on Montgomery and this book - Magic Island - is a referred to as her "full-length" study of Montgomery's works. Each chapter takes a look at one work and tells you what was going on in Montgomery's life when she wrote the particular story. Waterston talks about people who influenced her during these particular time frames and also references Montgomery's journals quite a bit. I have no reason not to like this book and yet this is the second time I've tried reading it and have failed to accomplish the goal. 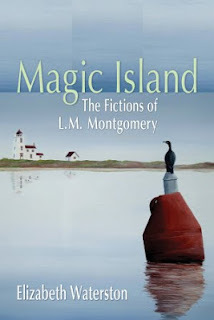 The first time I attempted Magic Island I had just finished reading Lucy Maud Montgomery: The Gift of Wings, by Mary Rubio. (Linked to my review wherein I highly recommend that read.) Coincidentally, Rubio is Waterston's co-editor for the Selected Journals. Rubio made reading about Montgomery and her life a delight. That book read more like a friend sitting down for a cup of copy with you, dropping interesting facts about Montgomery. Then, and now, I think Waterston reads like she's giving a lecture that she is trying to sound as sensational as possible. I can't quite put my finger on why it is that I don't like reading this book. I want to like it. Reading about Montgomery is interesting to me. However, I feel that Waterston tries too hard to make me like her and the energy is somewhat wasted. Really, I'd rather re-read The Gift of Wings. Still, I'll hold on to Magic Island for a little while longer and give it a go one more time. It might be that I need to not read this during the L.M. Montgomery Reading Challenge, but some time later in the year. 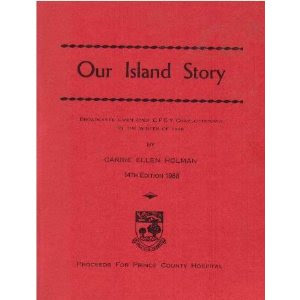 Secondly, I tried reading Our Island Story , by Carrie Ellen Holman. Again, if anyone who is not an Islander is prone to like this book, it would be me. Alas. Our Island Story is actually a transcript of a series of radio broadcasts that Ms. Holman gave over C.F.C.Y. Charlottetown in the winter of 1948. She wanted to give this series of talks to "give young people an understanding of the heroic struggle of their ancestors in wrestling homes from the wilderness and of the equally difficult task of winning for themselves and their descendants the freedom of responsible government." Not a bad cause and one that I can most definitely support. "During the summer of 1728 the prospects looked bright for a good harvest, when suddenly a devastating plague of field mice descended, repeating with intensified destruction an attack of four years earlier. From a report made by Roma of an attack ten years later we have an account from first hand of the habits of these pests and of the desolation left behind them. "This mouse,' he writes, 'is somewhat bigger than the ordinary mouse, of blackish color, with short legs and paws unadapted for climbing. It lives in the forest and feeds on herbs; like the squirrel it lays up stores for the winter of seeds, nuts and grasses. Its nests are to be found under rocks and in hollow trunks of trees. Its provident habits enable it to maintain its body in plump condition, affording thus a dainty morsel greatly prized by its enemies, dogs, cats, martens, foxes, owls, hawks and crows. It's fecundity is remarkable; every six weeks the female produces ten or twelve young. After heavy snow has protected them during several successive winters their increase is enormous and they burst forth on their devastating march.' They proceeded in a long narrow columns, destroying everything, not a blade of grass being left in their wake." In some respects I find that very interesting. (That was my favorite part in the history.) Ultimately, I made it from sometime before 1497 (when Indians were the sole population) to around 1769 when Charlottetown was growing into an actual town. Then it got to the point where I dreaded sitting down to read for fear of being bored and forcing myself to slosh through information which, while being sort of interesting, was not remotely entertaining to read. A bit dull, you might say. Even though it is the dead of winter. But it's 2013 and I have more options for things to occupy my "spare" time. I'm not saying that I will never touch this book again. I might. It's very short and doesn't actually take a large amount of time if you refuse to let yourself daydream and focus on getting through it. So. There are my "failed" reads for the Montgomery Reading Challenge this time 'round. Truthfully, I can't say I feel very guilty. I had to check to see if Magic Island was by the same author as an LMM book I read two years ago, but it was different: that one was Irene Gammel. But I know what you mean -- I've had that experience where I should have liked a given book for various reasons but didn't. I agree with you that some people should not try to write history. Tell the story, avoid running off on trails and losing the narrative thread. Oh, well. At least you tried, and haven't completely closed yourself off from trying again. Your first book seems like it should be really fascinating. It's a shame that it hasn't been.